You have a business to run and a hugely complex infrastructure to manage. You need a partner who is ready to make cloud work for you, application by application. 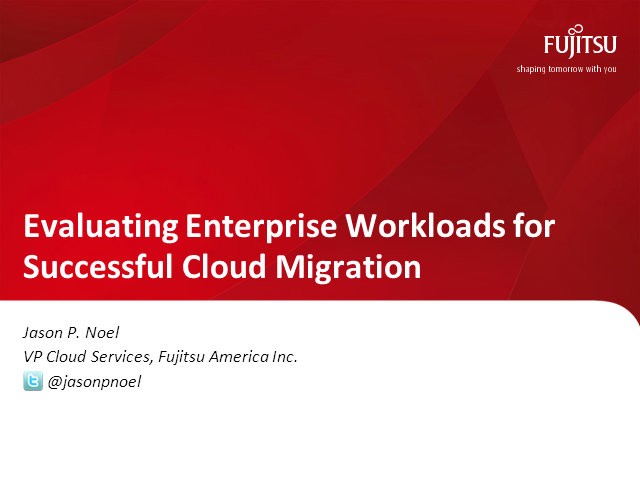 This session will summarize the business value approach Fujitsu utilizes to help our customers assess their workloads for migration to the cloud. This approach considers much more than IT technology. Our approach is different in that we focus on business value, understanding workload demands, and aligning business needs with IT capabilities. We emphasize a holistic view, recognizing that cloud is not a one-size fits-all solution; we understand the customer’s business and their drivers for change. Leveraging global partnerships allows us to increase the use of the ‘right’ technology to balance innovation, cost, and future readiness, and identify an appropriate solution to your business challenges. The approach helps you future-proof your cloud strategy through a series of facilitated working sessions to create a comprehensive roadmap for your cloud journey. The outcome is a well-documented and business-ready roadmap. We will also help you build a high-level outline business case based on the roadmap. The result of these sessions is not a “shelfware” strategy document, but rather a dynamic and actionable approach for delivery of short-term results with a long-term vision for the future. Jason Noel, VP Cloud Services, Fujitsu America Inc. Presented by: Jason Noel, VP Cloud Services, Fujitsu America Inc.